SHORTLISTED FOR THE BEST NON-FICTION BOOK AT THE PARLIAMENTARY BOOK AWARDS'Fresh, gripping and vivid' Simon Sebag Montefiore 'Exhaustively researched and scrupulously even-handed' David Starkey 'A portrait that chills you to the bone' Leanda de Lisle, The TimesThe last Plantagenet king remains one of England's most famous and controversial monarchs. There are few parallels in English history that can match the drama of Richard III's reign, witnessed in its full bloody intensity. A dedicated brother and loyal stalwart to the Yorkist dynasty for most of his early life, Richard's personality was forged in the tribulation of exile and the brutality of combat. An ambitious nobleman and successful general with a loyal following, Richard was a man who could claim to have achieved every ambition in life, except one. Within months of his brother Edward IV's early death, Richard stunned the nation when he seized the throne and disinherited his nephews. Having put to death his rivals, Richard's two-year reign would become one of the most tumultuous in English history, ending in treachery and with his death on the battlefield at Bosworth. By stripping back the legends that surround Richard's life and reign, and returning to original manuscript evidence, Chris Skidmore rediscovers the man as contemporaries saw him. 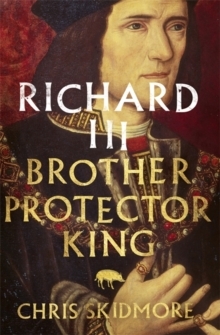 His compelling study presents every facet of Richard's personality as it deserves to be seen: as one of the most significant figures in medieval history, whose actions and behaviour underline the true nature of power in an age of great upheaval and instability.